It was almost like lightning struck in my office, my mind wandering from censorship to food, as it inevitably does at various points each and every day. Speculoos Cookie Butter is already genius — I want to shake the hand of the person who one day thought it was a good idea to turn Belgian spice cookies into a spread — sweet and naughty like Nutella, but somehow almost savory like peanut butter. I eat spoonfuls of it straight from the jar when I’m hungry and out of cereal — standing over the stove making pasta, chopping vegetables, or staring wistfully out a window. You’ll know it if you’ve ever stopped at the Wafels and Dinges cart at the southeast corner of Central Park after a run, or at one of their other carts parked throughout the city; Speculoos’s pairing with Belgian waffles is heaven. 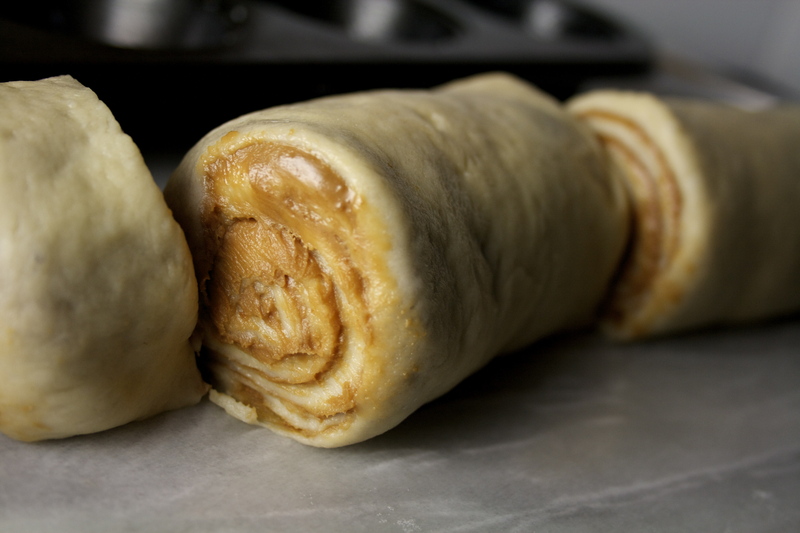 And so, suddenly, while dreaming of weekend bakes, I thought, wouldn’t it also be perfect in roll form? 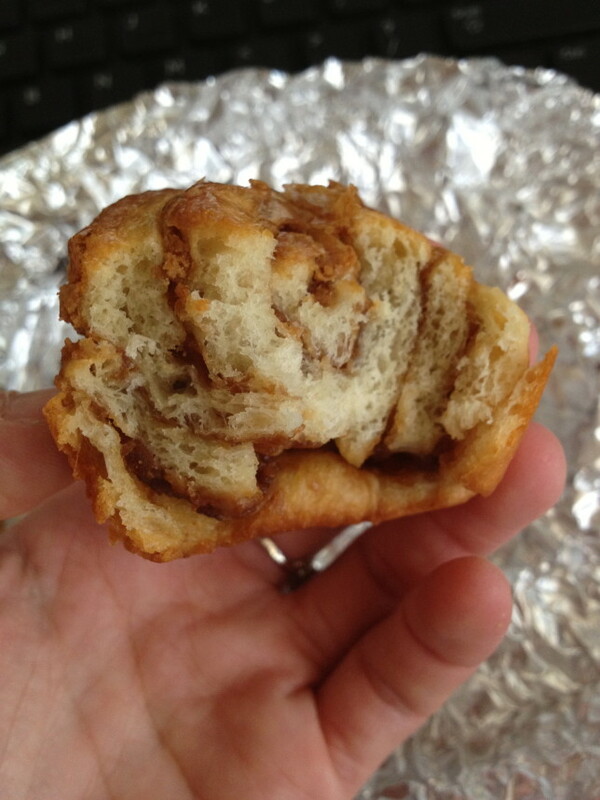 Not content to over-inflate them into monstrous, gooey cinnamon rolls (because do they really need a frosting? My instinct said no), I decided to bake them up in a muffin tin, declaring each a “bun,” separate but equal. I used buttermilk in my dough, the bit of sour to balance the sweet (and tenderize, of course), and knew in my heart of hearts that the answer to life’s great question, “how does magic happen?” was rolling the dough thin, spreading the Speculoos thick, and watching little rounds bake up into puffed, towering spirals; the scent of caramelized cinnamon and nutmeg and something otherworldly wafting through the apartment and lifting even the most downtrodden spirits. Could anything be more lovely? Can anything be more special? They’re a little bit fall, a little bit winter, but perfect any time of the year. The outside browns beautifully, encasing each layer, the center melting into ecstasy. Truly, no frosting is needed, no accoutrements necessary to dress it up, pep it up. Why hide beauty? Why mar perfection? These Speculoos Breakfast Buns are going to be my new weekend brunch staple. I hope they become yours, too. Can we make this a thing? Let’s make it a thing. Psst! 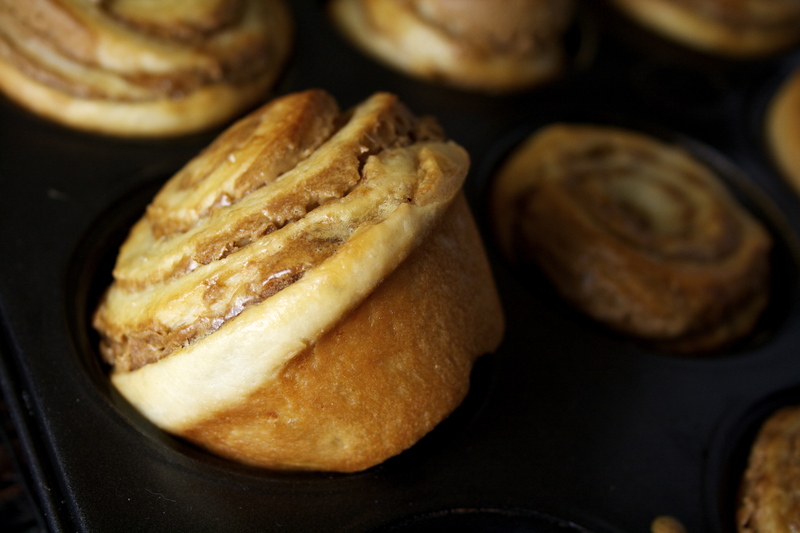 Hey, world, have you heard about Speculoos Breakfast Buns? 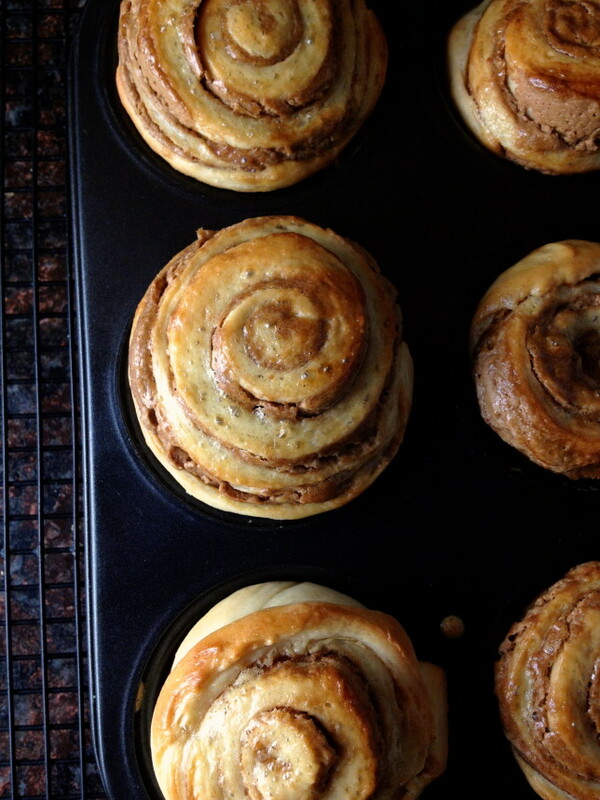 The inspiration for these buns comes from Smitten Kitchen. I love the way the dough bakes up so light but rich. And to say they’re easy would be an understatement; kneading the dough on low is a dream for my overworked stand mixer, which has a tendency to inch closer and closer to the edge of my counter, even falling over if I’m not watching, while in the midst of kneading my cinnamon roll dough. The dough is sticky until after the first rise, so it’s easy to work with at that point. You can use a rolling pin or your hands. I did both, rolling but pressing the dough when necessary to make it even. As for the Speculoos spread, you can find it at Trader Joe’s. A similar version is made by Lotus, the brand that makes Biscoff Cookies (brand name of speculoos cookies — sort of like how a “Kleenex” is just a tissue, a Biscoff is just a speculoos cookie). I almost bought it the night of my sick-but-need-it adventure, stopping at the supermarket on my way from work to the subway, but they wanted double the price, and I didn’t see nutmeg listed as an ingredient. I’ve also read that it’s smoother than Trader Joe’s, which is just fine, but I like the subtle crunch in TJ’s. Use what you can find — there are probably others out there now — it’ll be amazing no matter what. In a small bowl, whisk together the egg, sugar, and warmed buttermilk. Set aside. In the bowl of a stand mixer fitted with a paddle attachment, combine flour, yeast, and salt. With the mixer on low speed, add the egg and buttermilk mixture and mix until combined. Add butter, and mix until incorporated. Remove the paddle attachment and switch to a dough hook. Knead the dough for about 10 minutes on low. It will be relatively sticky. Place the dough in a large bowl that has been greased with butter, cover with plastic wrap, and let rise for 1-1 ½ hrs, or until doubled in size. Generously butter a 12-cup muffin tin. 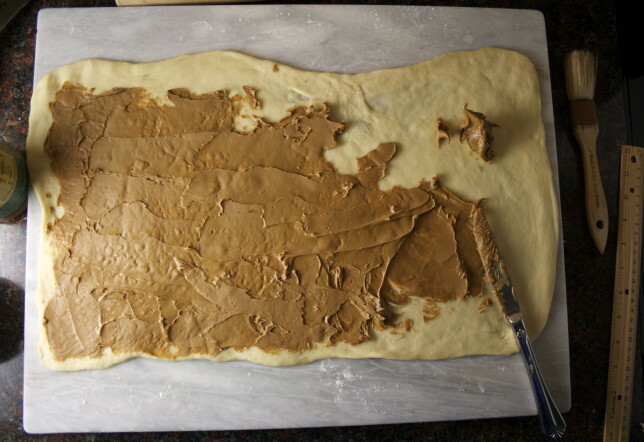 Turn the dough onto a well floured counter and roll into a large rectangle, about 11 inches by 20 inches. Feel free to press and stretch the dough with your hands as well. The dough will be quite thin. 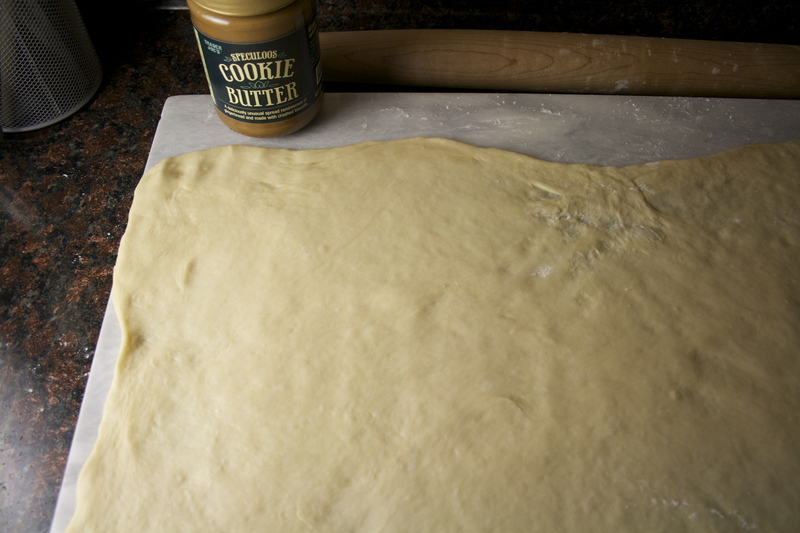 Gently spread the speculoos cookie butter in an even layer over the dough. Starting with a short side, begin rolling the dough into a tight log, patting the ends to ensure an even thickness. Pinch the seam closed and roll the log seam-side down. It should be about 12 inches at this point. Using a serrated knife, gently saw the log into 12 even slices. Place each slice in the prepared muffin tin. Cover with plastic and let rise for 30 minutes. After 30 minutes, whisk the egg and heavy cream and brush the tops of each bun. Place the muffin tin in the oven and bake for 15 to 20 minutes, and golden. Remove from the oven and place on a wire rack to cool. 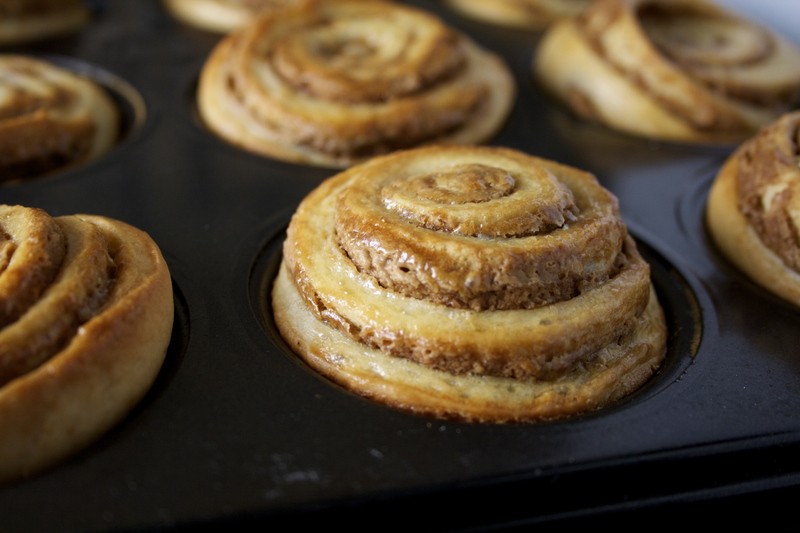 After 10 minutes, or when cool enough to handle, use a knife to gently loosen the buns from the muffin cups and place each bun on the cooling rack. Serve warm or at room temperature. Buns can be stored in an airtight container for three days. 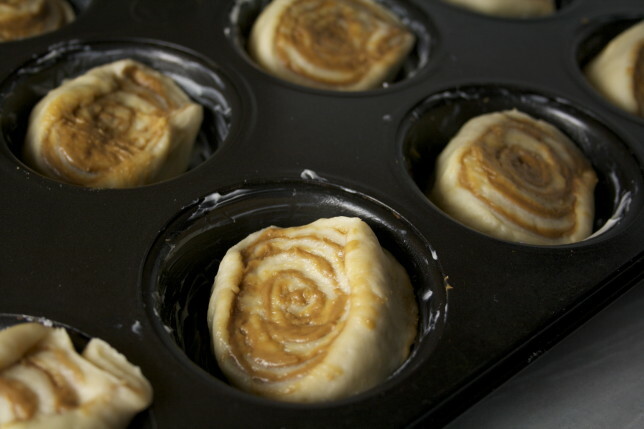 Reheat in a 300 degree oven or toaster oven for about 5 minutes to bring them back to life.